There is one must-have from the MAC Chenman Love and Water collection. The limited edition Force of Love Matte Lipstick. 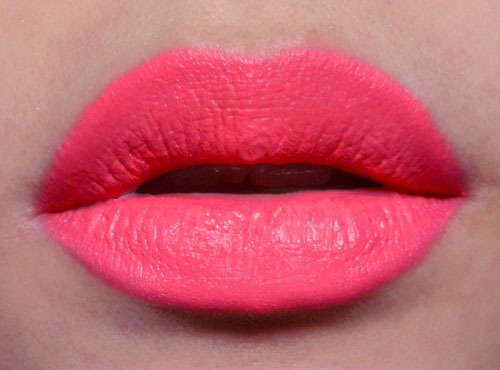 This is an unapologetic shade of fluorescent coral-pink that I think would likely look good on most skin tones although slightly different depending on your undertones. It's actually quite similar to MAC Viva Glam Nicki, which is out at the same time, but Nicki is a little more yellow, and Force of Love has more red/pink, which is likely to be more flattering for more people. MAC Force of Love worn with strong pink blush and Tan pigment on the lids. I only got one other item from the collection; Naval Blue pigment, but the Mineralize shadows are really pretty too, ESPECIALLY Love Cycle, a beautiful blue, but I decided to be more practical. Naval Blue is a little duskier than Love Cycle, so I figured I'd get more use out of it. One bad point to note about Force of Love is that this is similar to the newer Mattes from MAC (this is more slippery and waxy), which means you can't layer it on thick like you can with the old-school mattes (Russian Red, Diva, etc.) because it will start to shift and look uneven and patchy. Click here to read the full review about the texture, wear, etc! Swatches (L-to-R): Revlon Coral Reef Super Lustrous Lip gloss, Rimmel 005 Pure Exaggerate Liner, MAC Pink Nouveau Satin Lipstick, Barry M Pink Ribbon Lip Paint, and MAC Force of Love Matte Lipstick. Hee hee. I'm glad Nicki and this are different enough to warrant getting both for me! Looks lovely. Yes definitely check it out! The color is especially nice in daylight. I personally like the satin texture of VG Nicki more as MAC's newer mattes feel a little slippery and waxy to me but I can put up with it for this color! Yes, you should definitely check it out! It should look pretty cool on your skin tone. I am very pale with a very neutral skin tone that leans more towards the yellow side. But still very neutral the mac foundations are always to yellow or too pink for me. Do you think this lipstick would still look good on a pale neutral skin tone? :) Thanks! But it IS quite a strong, neon pink, so you'll need to be ok with that! Tuck your lipstick in a case for more protection against your lipstick melting in the humidity that accompanies summer.